Egypt's Foreign Minister Sameh Shoukry said Saturday his country hoped to resume normal relations with Turkey. 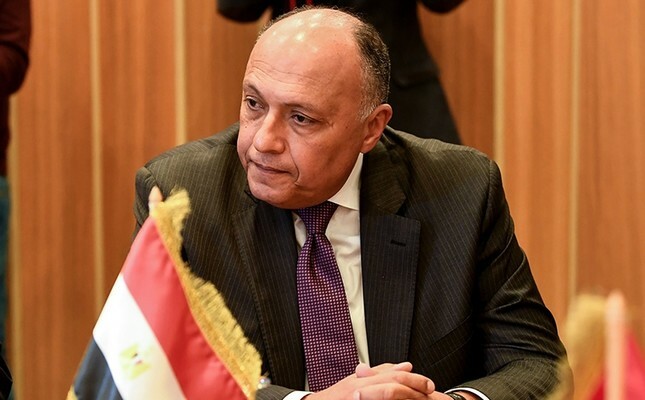 In an interview published by the state-run Akhbar Al Youm, Shoukry said Cairo had a permanent desire to overcome tension with Ankara. "There is no doubt that there are a lot of bonds between the Egyptian and Turkish people," he said. "We hope relations will return [to normal] and we are always open to this." Egyptian-Turkish relations have been strained ever since the Egyptian army ousted Mohamed Morsi, the country's first freely elected president, in 2013. Turkey has been critical of Morsi's ouster, describing his overthrow as a military coup. "The situation with Turkey remains the same and we reiterate our desire to overcome any tension based on the principle of non-interference in Egypt's internal affairs," he said. Shoukry represented Egypt at the Organization of Islamic Cooperation (OIC) summit on Jerusalem held in Istanbul on Dec. 23. Last year, Egyptian President Abdel-Fattah el-Sissi said there was no "feud" between Egyptian and Turkish people. Turkish Prime Minister Binali Yıldırım has also said that Turkey looks forward to repairing its relations with Egypt. Despite their strained political ties, relations between Egypt and Turkey have been improving at the economic level. Last month, an Egyptian delegation participated in a business forum held in Turkey with a view to luring investments in Egypt. Trade volume between Egypt and Turkey hit $4.17 billion in 2016. In November, Turkey declared a national day of mourning over the victims of a militant attack on a mosque in Egypt's Sinai Peninsula, which left more than 300 people dead.